No rest for the weary; a 4am wake up call for the trip to Atlanta. This was particularly annoying this trip due to the fact that I had not slept in two days and was not at peak physical condition, i.e. sick, but more on that later. Al was leaving Atlanta before sunrise on Sunday as he was off to Vegas for 37 days on Monday, so he wanted to have a bit of face time at home on Sunday before leaving. If you are buying, he is selling that it is work related. Yes, they really do have 100 day trade shows! The point being that we were making our own way to LGA on this Friday morning. Due to my regular parking solution being fully booked, I decided to try something new. I may have a new parking solution at LGA, but let me keep that to myself so the secret does not get out. And now for a bit of panic to be introduced to the trip…I could not find my cash. I had my wallet, but I generally carry my money separate. I knew that I put it into my bag, but it was not there and I do not generally lose things like this. Beth searched at home for the few places that it could be. I emptied my duffle bag. The cash was nowhere. So now I am thinking I am out a few hundred without ever having left LGA, and thus in a foul mood. But Beth had a thought to check Tiger’s doghouse. And alas, there was my money right next to Kitty Karryall (Yea, a reference that Beth actually got). My dog Gator had gone into my bag and took the money to his hiding spot, under our living room table. He has always liked money and going through pocketbooks and bags. So now I am not out the full amount, just the finder’s fee that my wife has charged me, although I am not really sure that is a winning strategy for her as Gator takes far more of her stuff than mine. But let’s see how that plays out. I am ready to start keeping score. I could now eat a lousy LGA breakfast with less stress. We board our flight to Atlanta. There was more college football gear on this flight than the flights we take to college towns where all that is going on is football. College town Friday flights should be 100% football fan flights. Instead this one to Atlanta put the others to shame. We saw at least 3 Auburn shirts, Alabama, Arkansas, and quite a few Nole girls on the flight. Of course my Gator shirt got many Go Noles comments. Fun! That is what a Friday morning flight in the fall should be. I was actually surprised at the number of FSU fans on this flight, mainly because the modern convenience of flying generally eludes those who are unemployed. Sorry, but I could not resist. This would be a foreshadowing of the number of FSU fans in town for this game. Ha Ha! After missing our connection to Akron (this will not be explained), we were off to the city. To our best recollection, this was the first Quest trip to fully utilize public transportation as we did not rent a car. We have driven our own car on trips before as well as utilized public transportation before, but never without having a car somewhere. So, at the Atlanta airport, we met up with Target and hopped on the Metropolitan Atlanta Rapid Transit Authority (MARTA) for the ride to the hotel. It was a nice ride and good bang for the buck. However, referring to this route as the “plane train” is a tad weak. It sounds like a kindergarten naming contest winner. C’mon Marta, do better. On the ride, I make my pick in the game… “Not only am I picking FSU, but I best bet FSU, and I bet FSU”. Good call! I wish that the hotel was a bit closer to the Marta station or Marta was a bit more extensive than North/South and East/West, but it was less than a mile so I guess I can’t complain too much. After an Al pit stop at Starbucks, we checked in to the hotel, a Hyatt House. This is an unfamiliar name as I know Hyatt and Hyatt Place but not Hyatt House. But it looked good online. We checked in and oddly, room 632 was on the third floor. Not really, we were told third floor and after the key did not work on 332, we went to 6th floor and 632 and we had a room. We deposited Brett in the room, as he had “work” to do and set off for Atlanta’s finest attraction, the College Football Hall of Fame. The only dining option for us was Chick fil A. I have never eaten in one given my refusal to eat chicken. It’s a political stance or I just don’t like chicken, I can’t remember. I assumed they must have something that is not chicken. I was wrong. So lunch was cole slaw, french fries, and a shake. Somewhere there is a cardiologist in cardiac arrest (and maybe Tina). Beth says “They do have really good chicken.” I think they call that an oxymoron. The Hall was a simple walk from the hotel. If you are a college football fan to any degree, the Hall of Fame needs to be on your list. It is well done and utilizes technology to significantly enhance your experience. Stop calling me a corporate shill please. When you walk in, you register your favorite team which guides the experiences throughout the HoF. Then you proceed to a wall of helmets. Over 800 of them. I knew there were a lot of teams, but over 800! It’s a lot of helmets. You then proceed to the playing field where you can kick field goals, catch passes, and throw passes. The kicking was ugly but the QB play was off the charts. The second floor contains many exhibits and interactive experiences, too many to name here. But a few of the highlights are; calling famous plays in college football history, being a guest picker on the set of Game day, trivia games, rivalries, equipment, coaching famous offenses, alternative helmet exhibit, tailgating, and a game day theater. The third floor holds the actual Hall of Fame. It is an interactive electronic hall that allows you filter the inductees, watch videos, and more. I can spend much more time describing everything you can do and what you can see, but I will just say “Go!” and you can learn more at College Football Hall of Fame. I should say that at this point in the trip, I first got a fever. I had been sick with a sore throat and a runny nose, but that was manageable. Now I had a fever. We headed back to the hotel so I could get a thirty minute rest before we had to head to the stadium for a tour that Al had arranged. Folks, he’s getting good at this. After the brief rest and 800mg of ibuprofen, Al and I were off to the stadium (Target was not done with his work), which was a one mile walk. I will say that it is not a good sign when it is 80 degrees with bright sun beating down on you and you can’t stop shivering with three layers on. I think Al thought I was going to drop, because I am always hot, but I just could not stop shivering. But I powered through so that I could see an empty Bobby Dodd Stadium that I would see again the next day. I jest because I really do like these stadium tours and I said to myself, when am I going to be in Atlanta again, oh wait, Georgia State. So, we met up with our tour guide Chris Yandle who graciously showed us around Bobby Dodd Stadium and filled us in on the history of Georgia Tech football, the stadium, and other fun things. 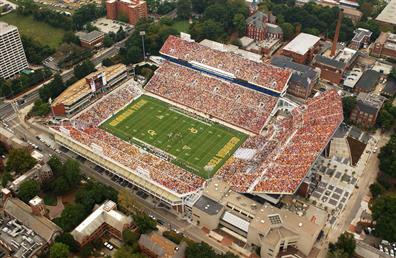 One really cool thing that we saw was that they built Bobby Dodd Stadium on top of the previous seating. We were able to go under the stadium and see the original concrete that was so well built that they simply drilled into the existing concrete when building the additions. Leave it to Georgia Tech engineering students to do that so well that we were able to see the original seat numbers. They must be smart or something. We then walked around campus a bit, albeit very slowly as I was dragging significantly at this point. There were many stops but a lot of walking. First it was the Barnes & Noble across the Interstate and we most definitely went the wrong way. Then to the student union, with even more breaks. Al made the executive decision that since I was not able to go back to the hotel and then back to campus for the volleyball game and that he probably thought I was dying, we would go back to the hotel and not return. After a bit more rest at the hotel, I was feeling a tad better and the fever broke. I popped another 400mg of Ibuprofen as a preventative measure and we headed to dinner. Dinner was Twin Smokers BBQ. Since I tend to be a bit more critical of restaurants, it was surprising that I had a more favorable opinion than Brett (yes, Target finally emerged for a Quest activity) and Al, but I was sick and had 1200mg of Ibuprofen running through my system. I thought it was pretty good except for the cornbread which was awful. Brett and Al did not think it was good at all. But again, they were drinking Candy Corn Moonshine so I guess we were all not in a frame of mind to render a solid opinion. But they stand by theirs and I defer. So, thumbs down it is. We had reached another decision point. Find a place to watch the Royals and Blue Jays or go back to the hotel and watch. I was already falling asleep so I was certainly going back, so back we went to the hotel. I don’t think I saw the clock hit 9:30pm. The fitness tracker estimate was that we walked 10 miles this day. I am skeptical it was that high, but we walked a ton. The very good thing about a 7pm game, is a late wake up. This is especially good when you are not feeling well. I think we made it down for breakfast around 10am. FYI Beth, the 10am is a typo it was really 7am. I know that Hyatt Place has a good breakfast and this clearly extends to the Hyatt House brand as well. It will definitely be worth keeping this in mind during future bookings. No continental breakfast here, it is the full spread. You will be interested to know that Target actually uttered the following sentence at breakfast, “There are some really nice parts of Kansas”. All I know is that I do not like the implication of that sentence. Target set off for the Hall of Fame to catch up on yesterday’s activities with the plan that we would meet up at the World of Coca Cola when he was done. So it was a lazy morning watching GameDay at the hotel. And another 800mg of Ibuprofen to attack the fever that suddenly returned. For the record, Al wanted to go to the Porsche Experience, for obvious reasons. I must sit back and admire the marketing plan that makes people pay $16 plus tax to visit a place that is a giant commercial for one of the world’s most iconic brands. Or, I just paid $16 plus tax for all you can drink Coke products. Either way, we were robbed. It was a nice museum and we got to try some foreign flavors of Coke that were truly dreadful, but I guess it is tough to get your money’s worth on Coca Cola. Now if it was $16 at Anheuser Busch (oh sorry, InBev) that would be a different story. FYI – I did not see any mention that early Coca Cola contained cocaine. I guess they forgot about that, like New Coke. After Coke World, we headed for lunch but every restaurant was closed for a private event. We had no choice but Johnny Rockets. Looks like Al would be joining me at the sick table as his stomach can’t handle Johnny Rockets. We had a bit of R&R at the hotel prior to leaving for the game. 400mg of Ibuprofen later, we were off on the one mile walk to Bobby Dodd Stadium. We surveyed a bit of the tailgate scene and it was all FSU. By the looks of the walk to the stadium and the pre-game festivities, the crowd was going to be 95% Noles. We stopped into the union to get Target a shirt and ran into the Ramblin Wreck color guard. Crickets. We had a mish mash of tickets, nothing that allowed us to sit all together initially, but after a pit stop in the cramped outdoor press deck, we eventually settled in the overflow student section in the end zone. By kickoff, we legitimately assessed the crowd at 55% GT and 45% FSU. There was a lot of Garnet and Gold. And how do they get that band so damn loud. The FSU band was situated in the opposing end zone at the very top of the stadium. But they were loud. The game opened with an FSU 3 and out. On the next possession, FSU intercepts GT and starts from the GT 19. A nice job by the GT defense as they held FSU to a FG after FSU had 1st and goal from the 2. FSU 3 GT 0. GT answers with a FG of their own to tie it at 3-3. It was a rapidly moving game as GT was keeping the ball on the ground. The first possession of the 2Q for GT was another INT, which set up an FSU TD and FSU now led 10-3. After a 5 play GT possession, FSU went on a 10 play drive for a 27 yard field goal and a 13-3 lead. 4 plays later, GT pulled close with a TD of their own and we had a 13-10 game. FSU closed the half with yet another Aguayo FG and we were 16-10 at the half. The 3Q opened with an 11 play, 52 yard drive by GT for a FG to pull within 16-13. FSU then punted after 5 plays. GT ran 9 plays to close the 3Q. FSU had one drive and 2:44 of possession time in the 3Q. GT eventually had to punt on this drive. The next possession, FSU took the ball on a 9 play drive down to the GT 5 yard line. The drive would end with a Golson INT, the first FSU offensive turnover of the year. This was the drive where FSU could have pulled away and all but ended the game, but it was not to be. GT could do nothing with the turnover and had to punt. FSU could not match the earlier drive and had to punt as well. GT would then go on an 8 play drive to tie the game at 16-16, but they left FSU with some time. FSU only needing a FG to win and having one of the nation’s best kickers, only needed a bit of time and a bit of yards. FSU lined up for the 56 yard field goal. It was blocked and returned by GT 78 yards for the game winning TD with no time left on the clock. What a way to end what was not an entirely engrossing game. But the end was dynamic. I fully expected Aguayo to drill it down the middle. When it was blocked, channeling Leon Lett, you just wanted GT to leave it alone and take OT. But Lance Austin saw a path and picked up the ball and the only ones with a shot to get him was Aguayo and the holder and that was not going to happen. It seems like these dynamic endings are increasing and I was glad to finally be at one. It was made especially sweeter by the fact that it happened to FSU. The crowd then stormed the field and we joined them. It was an improbable finish and a highly unlikely FSU loss. After the post-game celebrations waned, we took the mile walk back to the hotel in search of dinner. The Quest for Food was unsuccessful. Every restaurant but one was closed. This is not very good business. Sometimes you should just be open late as it makes sense. A lot of business was lost in our area around the hotel as we were not the only ones searching for food. What you need to know is that Al’s dinner consisted of combos and pop tarts. Thank you Hyatt store. As mentioned previously, Al slipped away in the pre-dawn hours to catch his flight back to NY, so his family would know he exists, prior to his departure for Vegas. So it was just Target and I for the wonderful Hyatt breakfast, although they do need to work on that omelet station as it was a disaster. We utilized the noon checkout before heading out. It was Marta to the airport for me and another hotel for Target, as he was not leaving until Monday. Glad we did not spend the day watching football, because his fantasy team destroyed mine. Fluky things abound on this trip! I thoroughly enjoyed seeing all the sad FSU fans at the Atlanta airport on Sunday. It was a nice sight during a Gator bye week and there were a lot of them. The flight home was uneventful. Thanks to Southwest and its Wi-Fi which enabled me to watch the Giants Cowboys game which made the flight pass in no time. It is always nice to travel on Sunday during football season. We did not get a school sign picture at Georgia Tech – first time ever? Target, are you taking notes? The Noles finished the year with a 10-2 record with the only losses being this game and to Clemson, which lost in the national championship game. This resulted in a Peach Bowl appearance where they were thoroughly demolished by a Houston team led by first year coach Tom Herman. The 38-24 score does not indicate how one sided this game was. This game was the Yellow Jackets shining moment of the season. After starting 2-0 beating Alcorn State and Tulane, this was the only other win of the season surrounded by 9 losses. I still do not know how GT won this game. 3-9 does not get you to a Bowl Game, not even this year.